Learn more about our engagement approach to working with you. Young Canadian companies with high growth-rate ambitions struggle to gain access to capital because of a lack of knowledge and to deploy it for maximum results. Access to the right kinds of capital and the wisdom to use it to create wealth is the disruptive growth advantage. High-growth entrepreneurs do more with what they have and keep more of what they have struggled to achieve. The Kemball Group focuses on high-growth Canadian entrepreneurs who want to sustain 20% plus year-over-year growth for 10 years or more. We look for entrepreneurs who want to make a positive difference in the lives of their customers. We help these Canadian innovators beat the odds in building highly successful businesses, without giving up control. The Kemball Group is designed to provide founders’ advice on whether or not and how to grow their business at more than 20% a year, year in and year out. Few do, fewer should. For each who should, their specific requirements dictate what we do and how. It is highly individualized and tailored consulting and if the entrepreneur does very well we will do well. The earlier in a firm’s history the issue of growth rate is tackled, the better the odds of survival for a decade or more. We start every engagement with discovery sessions to bring into the open the many layers nested within any high potential idea and the business model needed to bring it to successful commercial fruition. We sit down with entrepreneurs and their business colleagues and review operational plans and goals to understand their real picture in 3D and its financial implications, including what’s needed to grow, whether they have working capital that can be unlocked and what risks are involved and for whom. Identification of the right kind of money from the right kind of people. We strongly believe that entrepreneurs should maintain equity and control whenever possible. In fact, our motto is “equity if necessary, but not necessarily equity.” We identify alternative financing that frees up capital locked up in instruments such as receivables and tax credits. Other options include royalty financing against future sales, debt solutions that do not carry the seeds of future trouble and angel financing tailored to your unique capital needs. High-growth rate companies are not right for standard bank lending, while traditional venture capital is available to about one percent of those who seek it. Worse, it is often punitive to founding entrepreneurs even when the business succeeds. When it comes to financing, the evidence is clear: founder-led firms create more wealth and they retain more of it. Access to business and professional advisors: No entrepreneur can or does do it alone. Successful growth companies take advantage of teams inside and outside the firm. Complementary use of outside experts in business strategy and operations, IP law, accounting, marketing, sales – all play a part in succeeding. The Kemball Group works closely with your internal experts and connects you with top outside experts to ensure that entrepreneurs have the right advice. 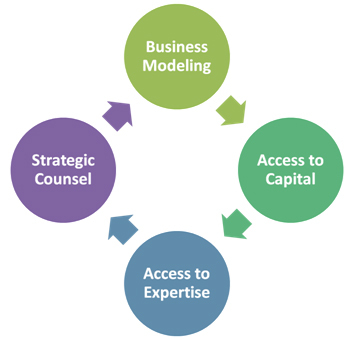 Strategic counsel: Access to capital alone is not the answer to sustaining high growth. Entrepreneurs need to invest capital intelligently to fuel profitable expansion. The Kemball Group knows that the wit to use money well is the difference between success and failure. Through our network of experts, we work closely with our high-growth entrepreneurs post-financing to help ensure that capital is being used wisely, your investors are informed and potential setbacks recognized and dealt with before they become catastrophic.